A 95-year-old man sits on his sofa, looking at the woman to his left. His eyes well up and his bottom lip quivers. “I’m not the hero in this story,” he says, his voice cracking. He’s reliving a vivid memory from his past, one that happened more than six decades ago. The woman, too, is deep in thought. Her face registers joy. The silence is deafening, but for the sniffles. 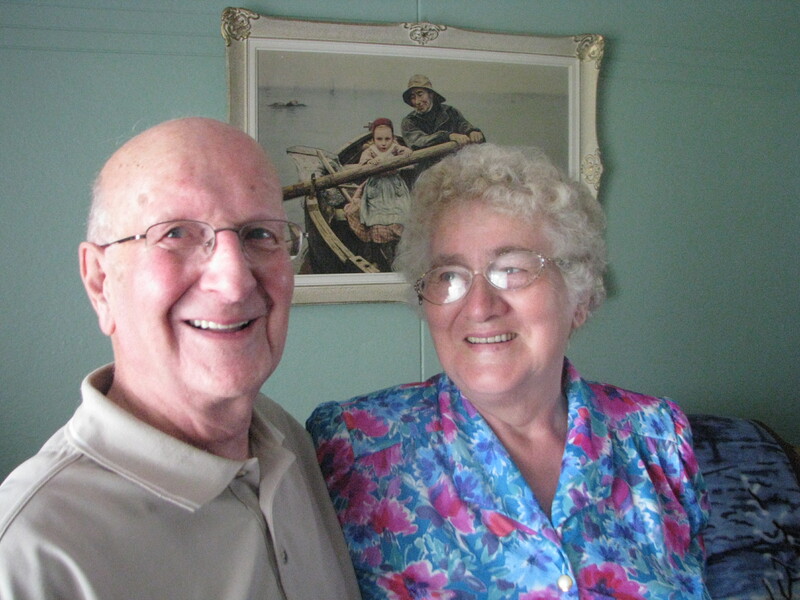 Today, Everett Moore of Clarke’s Beach and Beulah Morgan of Conception Bay South share a special bond that will link them forever–a fateful day in February 1952, when Everett came to the rescue of Beulah’s mother. Three Pentecostal preachers’ kids–Lewis, age six, David, four, and Beulah Pelley–were playing on Clarke’s Beach Pond. Inside the house, Doris Pelley, the pastor’s wife; her sister, Elsie Porter; and their mother, Elizabeth Kennedy, were chatting. Suddenly, the door burst open and in rushed one of the boys. “Mom,” he shouted breathlessly to Doris, “Beulah’s gone down through the ice.” Beulah Pelley was almost two. The three women ran outside. Without a thought about her personal safety, Elsie dashed the 20 feet across the ice and jumped into the frigid water. Gathering her niece, Beulah, into her arms, Elsie threw her to Doris and their mother. One of them caught the young girl and carried her into the parsonage. But Elsie Porter herself was now in trouble. She was unable to climb to safety and getting weaker from the cold water. Not far away, Everett Moore owned one of the few telephones in town. His wife, Laura, got a desperate call from Doris Pelley, asking for help because Elsie Porter was in the water. Laura shouted to her husband, the proprietor of Moore’s Grocery Store, across the road. Adrenaline propelled him forward. He knew the ice was too weak to bear his weight. Grabbing a 15-foot ladder, he pushed it out on the ice ahead of him and gingerly walked toward the woman in distress. Elsie was up to her neck in five feet of water, but her feet were on the bottom. She flailed her arms helplessly. “I broke the ice with a stick,” Everett says. He then walked Elsie to shore. Everett Moore is unassuming about his involvement in the near tragedy, convinced he only did what anybody would have done. “Tears are in my eyes today because I’m a very emotional person,” he says. Beulah Morgan, Elsie Porter’s daughter, dries her eyes and gazes at Everett. “I could’ve lost Mom when I was 11 if Mr. Moore hadn’t been there,” she says. Beulah Pelley, the little girl in the water, is now a grown woman. Doris Pelley died in 1982. Elsie Porter died in 2001 at age 88. For years, Beulah Morgan had longed to meet the man who saved her mother’s life. In 2004, her dream became a reality, when she came face-to-face with Everett Moore. A dramatic conversation ensued. Great story Burton. I went to school with Beulah Pelley and remember hearing a story about her falling through the ice somewhere. Nice to get the full story. Great story Mr. Janes, I am Beulah Morgan’s daughter. I have heard this story many times.